Sometimes, you just stumble across something unexpected. Sometimes, fortune befalls the most deserving folks. Sometimes, you come dangerously close to discarding fortune because it is disguised like something else. Sometimes all of these things happen in the same incident. I met Dave years ago at a Porsche swap meet or car show or somewhere. Neither of us remembers exactly where, but it was almost a decade ago. We talked and shared our love of the early cars and of annual trips to the Limerock Vintage weekend each September. Over the years, we reconnected many times at events and vowed to visit each other at home. Somehow, that just never happened despite a few near misses. However, we continued to talk cars and my friend Ed met Dave and actually visited with him before I did. Then earlier this year, Ed and I went up to LimeRock for the ALMS race, and we connected with Dave and his son. Before heading to the track, we went for a quick visit to their place. To say that Dave has a unique place is an understatement. It is off the beaten path and the kind of surprising treasure that only old car/bike guys seem to create. At first, you notice a nice trailer, and the unmistakable nose or tail of an early 911 sticking out of the brush. Then you look around the workshop building and there are 3 different 911s all of which need some work to get back to roadworthiness, but all of which are in fairly good structural shape. 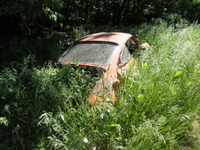 Then you wander down a hill and notice that along the way there are more 911s sticking out of the woods in varying states of decay. Many of them are under tarps. Then you notice a concrete pad area full of 911s and a few 912s. These are arranged nose to tail in order to fit on the concrete area and many are also covered in tarps. There are perhaps 15 cars in this area. You would think that Dave has been at this for decades, but it has been less than 10 years. Then you visit another building with maybe 10 911s out of the weather and a 914-6. These cars are in the best shape and are stuffed nose to tail into the building. Dave and his son describe the process of getting these cars packed in so tightly. A logistical ballet involving a jeep and some rope that you should not try at home. Most of these cars are very restorable. Then you look into the rafters of this shed and you see a few NOS fenders, bumpers in good condition, and an assortment of parts for early cars that would be a treasure by itself. An amazing cache of cars and parts that almost constitute a 911 salvage yard. But that is not the most amazing thing, for many among us have some parts and parts cars laying around ? Maybe not this many, but a few. No, the most amazing thing is that most of these 911s are of the 911S variety or very early cars, or relatively rare versions like a soft window !! That's right, this assortment of cars is mostly made up of the pinnacle of early car desirables. The 911S was the top of the line, and the most sporting configuration with its track friendly camshaft, spoiler, auxiliary oil cooler, and other go-fast goodies. These are becoming more sought after by the minute, and Dave literally has a treasure trove in his backyard. He has amassed them the old fashioned way, by hunting out old cars and scoring a deal here and there amongst the wild goose chases. No magic. Which makes the next part of this story all the more satisfying. Dave was going to have a rotisserie made for some upcoming work, and pulled one of his not so great examples out of the woods as a template car. As he and his son looked at the car, they noticed that there were no indentations in the rear deck for the normal stickers. However, they quickly dismissed this as being a botched repair job from long ago. Then they noticed slight differences in the dash, and a serial number stamped into the dash. They posted the serial number online, and set off a deluge of emails and calls! It turns out that they had one of the earliest Porsche 911s built. In 1964, Porsche built 235 cars which are highly sought after and valuable no matter what condition they are in. After all, they were still producing the 356 in that year, so these are the first production 911s sold. Dave had one of the 235, that he almost chopped up for a frame jig !! The owners of the 235 cars are celebrated collectors and afficianados such as Jerry Seinfeld. All of a sudden, Dave was getting contacted by the who's who in Porsche collector circles. For now he has decided to keep the car, but either way, this could not have happened to a nicer guy.